Many assumptions are made about me and my involvement with Bourne Free, our local Gay Pride Festival. I know this because of the random messages & emails that people send me year on year, many declaring me a heretic, questioning my suitability for ministry and some even contain swears and threats. I also know this because my friends are often put in awkward positions where people question them or they are put in positions where they feel they have to set the record straight on my behalf when they over hear others (usually local church leaders) saying false truths. And I know this because sometimes (very rarely) some one is brave enough to speak to me face to face (I would love it if more people did this, I'll even buy the coffee). Tuesday 7th July - Streetspace Bournemouth visited Space Youth Project's Bournemouth group for an evening filled with chatter and #BLOOM making. 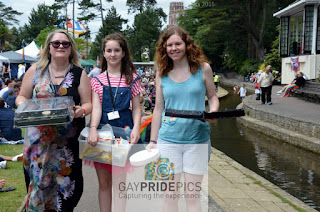 Kevin and I both used to work for Space and are keen supporters for all it does to raise awareness and education of all things LGBTQ and for the safe, stable home it creates for young people under 25 who identify as LGBTQ. In an ideal world no one would need a seperate youth group but alas the world is far from ideal! Space is a confidential, safe, life line for many, many young people. They often get young people asking faith related questions and Space are always proactive at connecting us up. It is a privilege to be known as good people who love a great God and for Space to trust us with the precious young people in their projects. 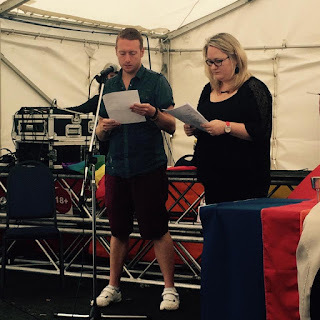 Thursday 9th July - I gathered with other local Christians to pray. The invite was open to anyone who wanted to attend. 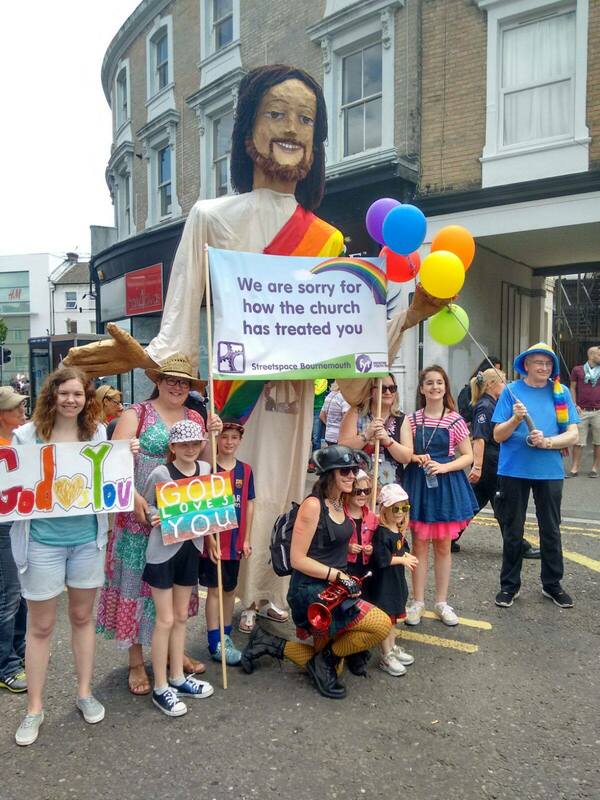 Bournemouth is over run with churches but alas only 2 were represented to 'Pray for Pride'. Bourne Free attracts thousands of people to our town each year, volunteers host the event and staff in local bars and venues work their butts off so it seems only fitting that we should ask God to protect people, to bless those that serve others and to be present in the joy. Ever thoughtful Kevin had collected small chocolate gifts to give the local bar staff with just a little note to say we were praying for them. In todays world where the train of thought is that people aren't interested in religion it appears people are interested in prayer, our presence was met with respect and welcome. It's one of my favourite parts of the week! After our ninja efforts to get the flowers up in record time before people noticed us (by the way they lined the entrance of the arena) Lizzie and I enjoyed a cuppa and waited to meet with South Today. In the evening I went with my daughter to watch the flash mob. The team that organise this are always so creative and this year didn't disappoint, you can check it out here. Then we headed to the arena to enjoy an evening of 'Sing a long a Sound of Music' live entertainment, free bouncy castles and candy floss. My daughter is 12 yrs old and she had a great night with her friends. The place was full of children! Thank you to the Bourne Free team for hosting such a beautiful mixed evening. Everyone was uniquely diverse and yet beautifully unified! You might not get why we were saying sorry, fear not you can read up on it here and you might disagree but you do need to know that these signs generate reactions. If you know me or you dip in and out of this blog then you will know that I don't like sharing other peoples stories. They aren't mine to share. But you do need to know that just on Saturday alone at least 50 odd people, total strangers, walked up to us and shared stories of pain, suffering, self loathing, family rejection and hurts. Some just thanked us, others teared up, some needed hugs and others prayers. Its a very humbling situation to be in when people share a part of they journey with you and I am thankful that God connected us to each one of those beautiful humans. 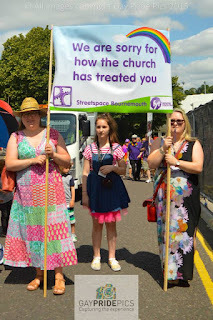 Jim, Nina and Nikki from Liberty Church Blackpool joined Bourne Free for the weekend. You can read about why they brought Jesus to Pride here. Theres a few picnics in the bible, people gathering together sharing food so thats what we did. We gave away hundreds of sandwiches, crisps, cold drinks, fruit and cake. People were quite confused by this but once we explained who we were they gladly took our gifts and ate with us. Free gift isn't something that is often actually for free but it was great to be able to bless people, sure it sparked many conversations and prayer opportunities but we won't share those with you! Then we regathered in the gardens and carried on with our afternoon. A beautiful one it was too full of friends, sunshine, music and laughter. In the evening I went home and went to sleep! My mother on the hand partied the night away in the arena with my aunty, sister and cousin. They had a great night! 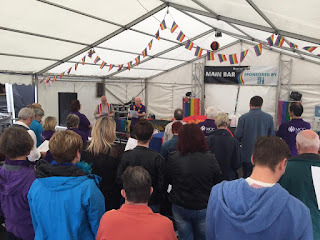 We sang hymns, we prayed, we read scripture and we heard a cracking sermon from Rev'd Dwayne! All pretty 'normal' christian activities (sorry to disappoint those that say otherwise). Gem: As wounded healers like Jesus, we have discovered a depth of compassion that is rooted in our pain and strengthened by our love. We are often the ones who care for the sick, the marginalized, and the weak. All: We thank you, God, that your compassion has touched us that we might offer this gift to our world. 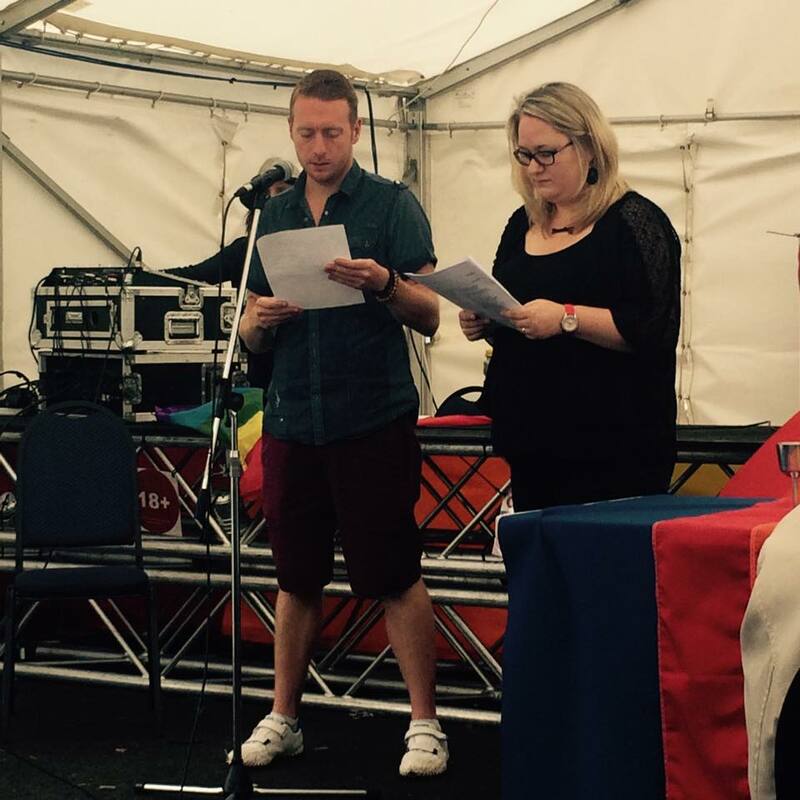 Kev: Lesbian, Gay, Bisexual and Transgendered people press the boundaries of the status quo. We create the avant garde, the ingenious, the fresh. We question why things are the way they are and then work to make them new and different. All: We thank you, God, that you have called us to join you in making all things new. Gem: From every walk of life, from every strata of our world, from every class and nation and race, we cross all categories of people. We, indeed, are the rainbow of the world. All: We thank you, God, that you have given us the gift of diversity and helped us learn the true gifts of inclusivity. 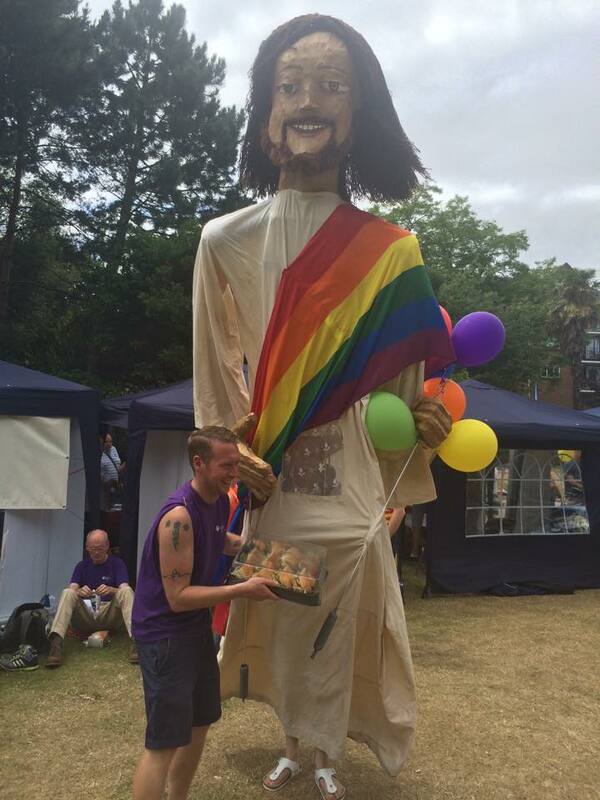 Kev: We are a deeply spiritual Queer people. Our faith undergirds everything that we are and everything that we do. God has chosen us to minister healing and wholeness in our community and in our world. All: We thank you, God, for calling us to a deeper journey. After the service like millions of other Christians across the world on any given Sunday, we gathered for a cuppa and some cake! So there we go, thats what actually happened. It was all very cultured, nice and as Lizzie said, thoroughly pleasant. I have written reflections on previous years on how welcoming, empowering and like coming home Bourne Free is for me. This is my community and these are my friends, my brothers and sisters in Christ. They are beautiful human beings and it is a sheer delight and honour that I get to spend time with them like this each year. I am already excited for next year, why don't you come and see what all the fuss is about for yourself?